This Ongoing War: A Blog: 21-Nov-17: Mass-murdering Charles Manson and mass-murdering Ahlam Tamimi: Who's more monstrous? Remorseless murdering psychopathic thug. And Charles Manson. the notorious cult leader who directed his followers to commit a string of brutal murders, and who became a symbol of the dark side of 1960s counterculture... 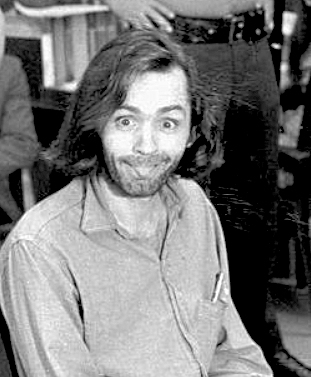 In 1969, his followers, known as the Manson Family, killed nine people. Among the victims of the killing spree was heavily pregnant Hollywood actress Sharon Tate, wife of Roman Polanski. One of Manson's young followers, Susan Atkins, stabbed Tate to death and scrawled "PIG" on the home's front door with the actress's blood. Four other people at Tate's home were brutally stabbed to death. The next day, a wealthy couple in Los Angeles, Leno and Rosemary LaBianca, were also killed by the clan. The killings became known collectively as the Tate-LaBianca murders. He was a monster on a mission. At his June 1970 trial in a Santa Monica, California, courtroom, the prosecution said Manson wanted the killings to spark a race war he called “Helter Skelter”. Manson was convinced the lyrics of a song of that name on the Beatles’ “White Album” contained coded messages describing that war. Manson's conviction arose from the murders of nine people. By comparison, our daughter's murderer was convicted in an Israeli court - after confessing to all the charges - of the murder of fifteen people. (A sixteenth person, a young mother, has been comatose from the moment of the Sbarro pizzeria explosion more than 16 years ago until today.) Tamimi has said for the record that she wished the toll were higher. Living free as a bird in Amman, Jordan, where she was born and where her family lives, she has happily (very happily) boasted of the central role she took in the planning and execution of the Sbarro pizzeria massacre. She has spoken of the pride she felt when fleeing the scene of the massacre that awful day, in the company of exultant fellow Arabs who were elated by the fresh news of a massacre in the center of Jerusalem. She has said on camera that she wished she could have told them it was she who did it. She presented the evening news a few hours later on a Palestinian Arab television station in Ramallah called Istiklal, opening naturally enough with big news of a "resistance" activity in "Occupied Jerusalem" and the many dead Jews, especially the many dead Jewish children. How that evil creature's heart must have soared. Also unlike Manson, she had no need of Beatles' lyrics. As she explained here ["08-Oct-17: Why kill religious Jewish children? Because, says Hamas celebrity-jihadist, this is a religious struggle"], her religious faith was all the motivation she needed to murder Jews. She is a devout Muslim. Because she was an actress, the most memorable of Manson's victims was Sharon Tate. Her being pregnant injected an especially painful note of poignancy to the coldness of her tormentors' zealotry. One of Tamimi's victims, an American woman pregnant with her first child (and herself the only child of her parents) was not in movies. Few will remember her name or the striking goodness of her life. 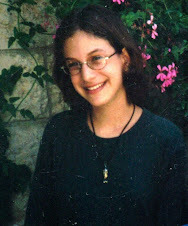 The memory of Shoshana Yehudit Heyman Greenbaum is honored by her many devoted high school students and friends, and by the work of Partners in Kindness. Connecting unfathomable evil to good deeds is a classic Jewish response. 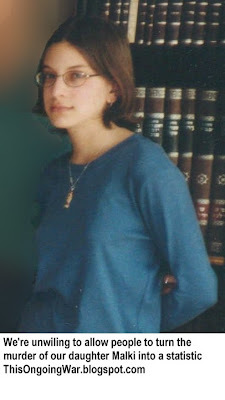 The life of our daughter Malki - another of Tamimi's victims - is honored by The Malki Foundation. If you have not heard of it and want to know what it does, please have a look at The Malki Foundation Blog. 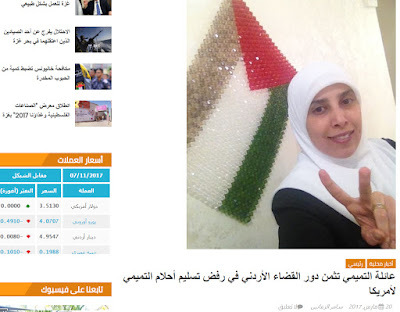 Ahlam Tamimi, confessed murderer, might die in a US jail. But some challenging things would have to happen first. US Federal criminal charges against her were unveiled in March 2017. That same day, her name was added to the FBI's Most Wanted Terrorists list and her face appeared on English and Arabic editions of an FBI "wanted" poster in which she is described, accurately we believe, as armed and dangerous. But meanwhile she is free as a bird, living with her husband and child in the Hashemite Kingdom of Jordan, less than 90 minutes drive from Jerusalem where she achieved her fame. The Jordanian authorities have told the US that even though there has been a signed and fully-in-effect Extradition Treaty between the two countries since 1995, they now say it was invalid from day one and they refuse to extradite her. Tamimi and her connections have expressed effusive thanks and praise [here] to the Jordanian judiciary. In Arabic (we use machine translation) they appreciate the intervention which allows Ahlam Tamimi "to live safe and secure under the banner of Hashemite under the leadership of His Majesty King Abdullah II Ibn Al Hussein" instead of being flown out, handcuffed, to the US. The Arabic article in which they say this (there is no English language article reporting their words) is accompanied by the portrait over on the right, showing Tamimi with a Jordanian flag, her fingers flashing V for Victory, and a smile on her face. Talk of Jordan being a constitutional monarchy ignores reality. It's a closely-held family business. Notwithstanding Jordan's argument, several felons have been extradited by the Jordanians to the US since it came into effect and are in US prison cells today. the United States should not give up on attempting to extradite Al-Tamimi... Jordan should reconsider its position and permit extradition in the case of Al-Tamimi for the safety of Jordanians, and citizens of other nations that may be subject to another attack by Al-Tamimi. Thwarting extradition not only violates the principle of comity, but it also perpetuates the international danger presented by Al-Tamimi. Meanwhile Jordan's king, Abdullah II, has made two triumphant visits to Washington so far this year, one in January, one in March. President Trump visited him in Jordan in May, and they met again in New York in September when the president praised him for "fighting terrorism of all kinds in the region". If anyone in the White House is aware in even the smallest way of our efforts to get Tamimi extradited, or of the duplicitous way Jordan is thumbing its nose at its treaty obligations with the US over her extradition, they are keeping it very close to their chests. They need to know that the things Tamimi, the fugitive from US justice, stands for are no less monstrous than those of Manson and his "family". But far more dangerous than Manson since she's alive and free, incredibly influential on a scale that non-Arabic speakers cannot grasp, and protected by powerful friends. So you are presumably thinking that the relevant US government authorities would want to seize the fugitive mass-murderer if she showed up. We're not experts in the field at all. But our understanding is that if the host country - treaty or no treaty - declines or refuses to extradite, the US will not go around that refusal within the host country's territory. That's not what we want to hear. But it is what we think is the policy. Shoshana with an L or Shoshana with a G?